What is the Long Range Development Plan? 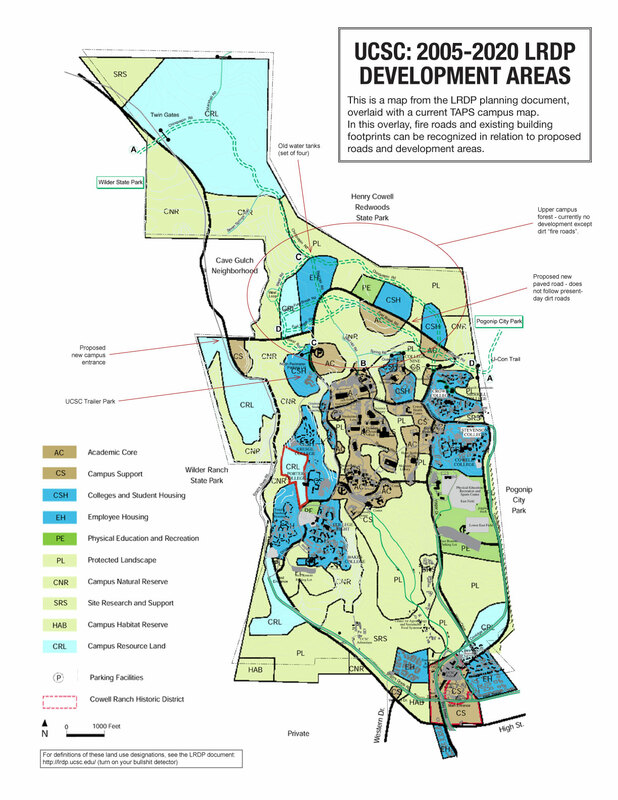 The 2005-2020 Long Range Development Plan is UCSC’s "general plan" for expanding the physical campus to accommodate several thousand new students, along with associated faculty and staff, by the year 2020. It calls for building new roads, residential colleges, classroom and research space, and other facilities on hundreds of acres of what is currently forest, chaparral, and meadows. Upper Campus refers to the undeveloped lands north of the present footprint of campus facilities, bordered to the east by Pogonip City Park, to the north by Henry Cowell State Park, and to the west by Wilder Ranch State Park and the Cave Gulch neighborhood. Thus, Upper Campus forms a crucial "bridge" and wildlife corridor between these open space parklands. The university also refers to the part of Upper Campus that they intend to build new facilities on as "North Campus." What is Save Upper Campus? Save Upper Campus is a coalition of local groups that share the common goal of securing the permanent protection of Upper Campus as an ecological reserve. The coalition's position is that the forest and chaparral habitat of UCSC Upper/North Campus is not an appropriate site for any future University development due to its immense ecological, educational, recreational and cultural value. What's the current status of the Long Range Development Plan (LRDP)? The 2005-2020 LRDP and it’s Environmental Impact Report (EIR) were certified by the UC Regents in 2006 and lawsuits targeting the EIR were settled back in 2008, however, the university still does not have clearance to build in Upper Campus because they have not been able to secure an extension of municipal water and sewer services. In addition to facing political and legal obstacles in efforts to push forward this highly unpopular plan, the university is hampered by funding shortages, and in fact is now soliciting donations from the Santa Cruz community. Santa Cruz is currently reassessing its limited water supply in light of climate change, extended drought, and the low probability of a desalination plant being built. We believe that now is also a critical moment to revisit the UCSC growth issue and dismiss once and for all the unwise and unsustainable project of Upper Campus expansion. Where exactly are they planning to build in Upper Campus? Since the LRDP is a general plan not an exact blueprint or timeline, it only provides us with approximate locations where UCSC plans to site future facilities. To get an idea of what parts of Upper Campus are being targeted, take a look at the LRDP land use and planning maps. In short, the proposed new facilities in Upper Campus form a large arc beginning at Crown/Merrill on the east side of campus, extending up to the abandoned water tanks at the West/Chinquapin Rd intersection, and wrapping back down to Kresge College. A major loop road would cut through the forest, not following the existing alignment of dirt roads, and would be accompanied by smaller access roads and parking lots and connected to a new campus entrance on Empire Grade via a bridge over Cave Gulch. The exact details of building/road locations and footprints will only be revealed as each stage of development progresses. Draft plans are now available for Social Sciences 3, the first specific LRDP construction project proposed for Upper Campus lands. What is LAFCO and what does it have to do with UCSC expansion? Since North/Upper Campus is outside the Santa Cruz city limits, the Local Agency Formation Commission—an obscure state agency that regulates the boundaries of cities and special districts in California in order to prevent urban sprawl—must grant approval for an extension of the City of Santa Cruz's "Sphere of Influence" before the city can provide water service for UCSC growth. Starting in December 2011, LAFCO held a series of public hearings regarding the Upper Campus expansion application, which were massively attended (standing room only at times) by students, faculty, and community members, a strong majority of whom spoke in favor of curtailing UCSC growth. Currently, the LAFCO approval process has been halted due to a lawsuit filed by a citizen’s group. What was the recent lawsuit that halted the process of approving the extension of water services to Upper Campus? Before applying to LAFCO to extend their "sphere of influence" and extend water service to Upper Campus, the city is required to produce a valid Environmental Impact Report, assessing the impacts of this extension. In November 2010, a citizens group named Habitat and Watershed Caretakers (HAWC), filed suit asserting that the city's EIR was deficient in a number of areas. Ultimately, the 6th District Court agreed with HAWC, invalidating the EIR and requiring it to be revised. Without a valid EIR, LAFCO can no longer consider the city/university's application, and the process is now stalled until the city moves to revise its EIR. Does Santa Cruz have an adequate water supply to accommodate UCSC’s proposed expansion? No. According to the city’s own environmental review documents, as well as federal wildlife agencies, there is not currently an adequate water supply to justify the level of expansion that is proposed. The city's EIR for extending water service to Upper Campus growth states "There are inadequate water supplies to serve the project under existing and future multiple dry year conditions." Therefore, in order to approve an expansion of water services to UCSC, LAFCO would have to adopt a "Statement of Overriding Consideration". This statement claims that the benefits to the community of approving the expansion outweigh the harm done by placing more strain on inadequate water resources. How can UCSC’s request for an additional 152 million gallons of water be called "neutral"? The city and university are calling proposed UCSC growth "water neutral" because according to LAFCO’s proposed conditions of approval, UCSC would be required to pay a few thousand dollars for every 85,000 gallons of water use beyond their current yearly average use of 176 million gallons. This money would go into a "UCSC water neutrality account" which the city would use to fund conservation measures to supposedly offset UCSC’s additional usage. In other words, instead of being a tool for minimizing drought risk for existing water customers, conservation measures would be implemented to make up for the impacts of unsustainable UCSC growth. 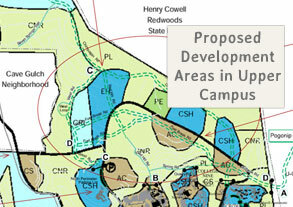 What are the alternatives to UCSC’s current expansion plan? Many alternative options exist that could satisfy the university's wishes for enrollment and program growth, while preventing further destruction of delicate and irreplaceable campus ecosystems and the unique educational environment they offer. We encourage creative solutions that involve the democratic participation of the campus and Santa Cruz communities, including wiser use of existing campus facilities (many are currently under-utilized) and an overall reassessment of the feasibility and sustainability of accommodating such a large enrollment increase at UC Santa Cruz. If such large-scale growth is to occur, we advocate that any future expansion of UCSC facilities be sited at a satellite campus in an urban or industrial-zoned location, and that any future improvements to existing facilities on the main campus be designed to minimize impacts to watersheds and ecosystems by utilizing existing building footprints and "building up" rather than out. The LRDP's Environmental Impact Report discusses alternative development locations at UCSC’s Silicon Valley Center (SVC) at Moffett Field in Mountain View, and UCSC’s Monterey Bay Education, Science and Technology Center (MBEST) in Marina. A satellite campus at an urban location closer to UCSC, such as the Santa Cruz Westside, Soquel, or Aptos is another alternative, however, the appropriateness of any future expansion must be assessed in light of the natural limitations of local infrastructure and resource capacity. Doesn’t UCSC have a contractual obligation to grow? "[T]he University has to acknowledge that growth on the UCSC campus cannot continue indefinitely and that to meet the stated needs of increased enrollment the University of California system-wide will need to look elsewhere. Personally, I think the time to do that is now, as the UCSC campus is growing well beyond resource constraints." What about building on the grasslands of lower campus? The "Lower Campus Alternative," analyzed in the LRDP's Environmental Impact Report, would favor development of the grasslands of lower campus rather than the forest and chaparral of upper campus. This is not an acceptable alternative, because the grasslands of lower campus are vitally important coastal prarie ecosystems providing habitat for threatened species such as the Red Legged Frog, Burrowing Owl, Golden Eagle, and Ohlone Tiger Beetle. Additionally, this alternative would not lessen the local water, traffic, housing, and quality of life impacts that such a large-scale expansion would produce.